Limited Edition Of 75. From her home studio overlooking the Kennebunk River in Maine, our artisan designs and creates breathtaking kaleidoscopes, many of which can be found in private collections and museums worldwide. This dichroic glass angel kaleidoscope is handcrafted from beautiful iridescent dichroic glass adorned with copper angels. It houses an internal two-mirror design that creates a circular mandala. The turning cylinder is hand made from fused dichroic glass. Stands on four brass feet. 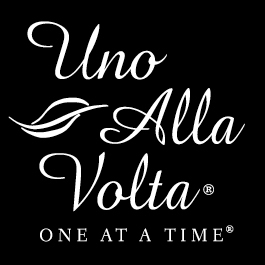 Each is signed and numbered by the artist, exclusively for Uno Alla Volta. 8.5 in. x 2 in. x 2.5 in.